Our 7th grade basketball team went to state this year and they could not have done it without the BEST coach!! Dennis was selected as "Coach of the Year" for National Trail Conference!! Way to go Dennis!! This was an easy card to make!! Since our school colors are Green and White, I used Glorious Green paper #101697 as the base. I stamped Just Basketball stamp #115004 by using the Stampin Up! Markers - Only Orange #100051 and Basic Black #100082. Then I popped the basketball up with Stampin' UP! Dimensionals #104430. 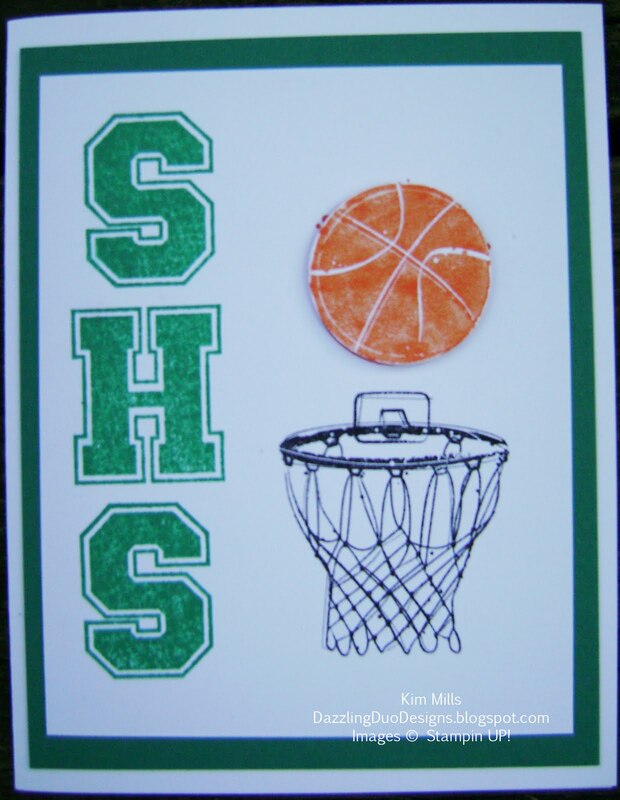 "SHS" is stamped in Glorious Green #103040 by using the Varsity Alphabet Stamp Set #113684. Congrats to the Shamrocks and Dennis!! We had a great season!! And the best cheering section! !